Those living in western North America probably have seen a netleaf hackberry, even if they didn’t know what sort of tree it was. Often nurseries don’t carry this species because immature trees are unruly, even being described as homely. That makes it hard for them to compete with other more attractive trees. However, few trees are hardier or longer lived than the netleaf hackberry. Slow growing, this tree will easily live for 100 to 200 years. It can thrive in areas with as little as 7 inches of rainfall per year, making it suitable for areas where other trees would not survive. A small-to-medium-sized deciduous tree, the netleaf hackberry has been around for thousands of years and has proliferated from the Pacific Northwest through the Rio Grande watershed. Native populations are found in Arizona, California, Colorado, Idaho, Kansas, Louisiana, Nevada, New Mexico, Oklahoma, Oregon, Texas, Utah, Washington, and Wyoming. The botanical name for netleaf hackberry is Celtis reticulata. The species was named by Swedish botanist Linnaeus in 1753. He used an ancient name given by Pliny to a sweet berry. He combined that with the Latin word reticulata, which means reticulated, a reference to the network of leaf veins. Celtis reticulata is a member of the genus Celtis, the members of which collectively are known as the nettle trees or hackberries. The genus Celtis is notorious for frequent hybridization. As a result, Celtis reticulata is often confused with several other species within the genus Celtis, most notably Celtis laevigata, Celtis occidentalis, and Celtis pallida. 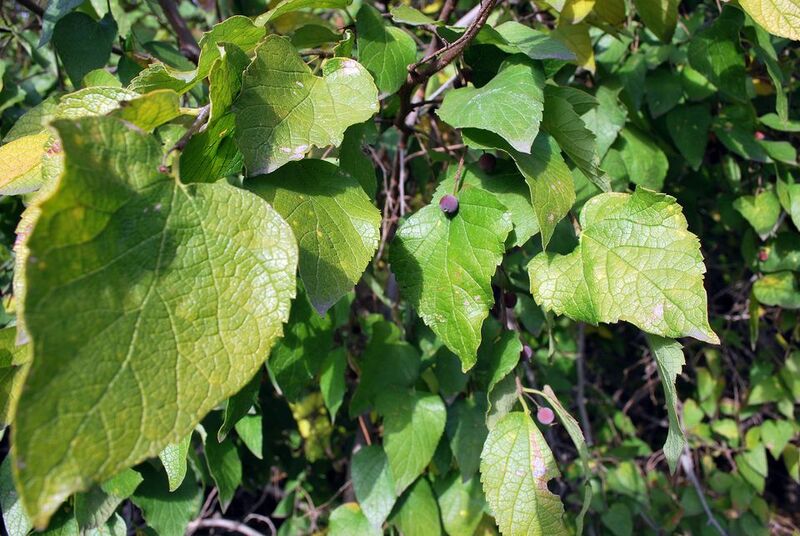 Some experts consider netleaf hackberry to be a variant of Celtis laevigata, also known as the sugarberry. Others believe it to be synonymous with Celtis douglasii, known commonly as the Douglas hackberry. However, netleaf hackberry is regarded by most taxonomists as the discrete species we know as Celtis reticulata. Known most often by the common name of netleaf hackberry, this species is also known by a variety of other common names, including acibuche, canyon hackberry, Douglas hackberry, hackberry, netleaf sugar hackberry, palo blanco, sugar hackberry, sugarberry, Texas sugarberry, and western hackberry. The common name of sugarberry is also used to refer to a similar species, Celtis laevigata, while the common name of Douglas hackberry also refers to Celtis douglasii. However, they are separate species. Netleaf hackberry is recommended for USDA hardiness zones 4 to 10, however, it is very hardy and can grow in areas with temperatures of up to 110 F, or as low as 0 F.
A small to medium-sized tree, netleaf hackberry is slow growing; typically reaching 20 to 30 feet in height and width. However, some specimens have been known to grow to as much as 70 feet tall. Conversely, some specimens remain smaller than average, and present as a large shrub. The trunk grows to approximately a foot in diameter and is often short and crooked. Netleaf hackberry prefers full sun, requiring a minimum of six hours of direct sunlight per day. A location with well-drained soil is best, however it can withstand severe droughts and wide temperature ranges. Netleaf hackberry is an excellent choice for areas subjected to desert heat, drought, high winds, and dry alkaline soil. This tree is also well suited to urban conditions and can be used in yards and patios as well as along street and boulevards. It is a good choice for a natural landscape or habitat garden but also does well in areas with heavy foot traffic. Netleaf hackberry makes for a good shade tree that has the added benefit of providing food for birds. Some nurseries cultivate it as an ornamental tree or shrub. However, some potential owners pass them up because as young trees they often have a scraggly appearance. Netleaf hackberry is often used in riparian restoration zones, along rivers, streams, springs, lakes, and floodplains. Another use for this species is as a windbreak, due to its hardiness and longevity. Although this species is drought tolerant and prefers well-drained soils, it should have a regular supply of water. It will grow in a range of soil types including gravel, rocky soil, limestone soils, sandy soil, or loamy soil. It can tolerate both acidic and alkaline soil. Placing rocks around newly planted young seedlings will improve viability until it matures. Once established, watering should be deep and infrequent. Up to twice per month is sufficient with more frequent irrigation if faster growth is desired. It is an extremely hardy species that will tolerate harsh growing conditions, including drought and even fire. In its native habitat, it is most often found in plains grassland, desert grassland, upper desert, and in woodland zones, where it is an invaluable tree to wildlife and livestock alike. In the Rio Grande Valley, it is frequently used as a means of cover by white-tailed deer. Mule deer and pronghorn feed on the leaves of netleaf hackberry, particularly during times of drought when other food sources have disappeared. In some areas, cattle, sheep, and goats also graze on this species, as it is a good source of protein. Deer aren’t the only wildlife using netleaf hackberry for cover. Birds also use it to shield themselves from predators and to nest in. Bullock's oriole, doves, quail, the scissor-tailed flycatcher, Swainson's hawk, and the white-tailed raven are only some of the birds that depend on the netleaf hackberry as a nesting site. Many birds also depend on the fruit as a source of food. In northern Utah the netberry fruit it is the most important winter bird food available. Among the birds that feed on the berries of this species are the American robin, American crow, band-tailed pigeon, Bohemian waxwing, cedar waxwing, northern flicker, rufous-sided towhee, scrub jay, Steller's jay, and Townsend's solitaire. Netleaf hackberry berries are enjoyed by a wide range of wildlife. In addition to birds, Barbary sheep, coyotes, foxes, and squirrels enjoy the fruit of this tree. Moth caterpillars rely on the leaves of the netleaf hackberry and beavers are known to feed on the wood of this versatile tree. Cattle find the tree useful for shade during hot periods of the year, as do quails and desert songbirds. Twigs from the netleaf hackberry are used by woodrats to build their homes. Emperor butterfly caterpillars feed on the leaves. Native Americans likewise found this species a useful food source. They regularly included the berries and seeds of the netleaf hackberry in their diet and also preserved them as a reserve food source for wintertime. They also used the bark for medicinal purposes and created a dye from the leaves. The Navajo used the berries as a digestive aid. The fruit is still eaten in modern times. It can be cooked and made into a jelly or used as a seasoning for savory food. It is also dried as fruit leather. Early homesteaders used the wood of this tree to build rough furniture, even though it is not an easy wood to tool. Today it is used for fence posts and as firewood in its native locales. In some areas, it is used to make barrels, boxes, cabinets, crates, furniture, and paneling. Artisans still make limited use of it to create a red dye. Little maintenance is necessary. If a more pleasing shape is desired, pruning the crown can be performed to achieve a better form. This species is hardy and resistant to many pests and diseases, being particularly resistant to cotton root rot fungus as well as honey fungus. Occasionally netleaf hackberry will fall prey to aphid attacks as well as swollen leaf galls. It is somewhat prone to developing witches'-broom, which is caused by fungi and mites. The infestation causes a busy overgrowth in a single point, resembling a bird’s nest or broom. The excess growth does not harm the tree and is sometimes used by wildlife as nesting spots.